Reading Ezra Pound can be a demanding experience as he often slips into French, Spanish, Italian, or ancient Greek—using the Greek alphabet of course. Occasionally the reader will also be confronted with a sequence of Chinese characters or even an ancient Egyptian hieroglyphic. His frame of reference is broad as well, drawing on poets and their works from the times of the Roman Empire, and ancient China right through to 20th century Europe. Yet his verse flows with a musicality that carries the reader along on a well-cushioned boat traversing a torrent of obscure, often archaic, cultural influences. From simple two-line observations to sprawling quasi epics, Pound can charm and frustrate. He is one of the major poets of the 20th century, an American who spend most of his adult life in Europe—apart from the 12 years of course that he was incarcerated in a psychiatric hospital in his homeland for allying himself with Mussolini’s Fascists during the Second World War. He was a confidant of T. S. Elliott, Robert Frost, Ernest Hemmingway, W. B. Yeats, and James Joyce. This volume is comprehensively indexed, translating the non-English passages and elaborating on the more obscure references. It includes a generous representation of The Cantos, which Pound began working on in the 1930s and continued adding to until his death. This selection represents the work of a poet who was closely involved with the canon of classic western European literature, not only as a reader but also as someone who was aware that he was adding to it. He was equally as comfortable with Chinese themes, tropes, and verse forms and adapting them for the English language, both mimicking them and translating other writers. Striking imagery, deftly delivered in a tightly written, rhythmic sequence of words that feel as if they were just waiting for Pound to put them in that particular order. 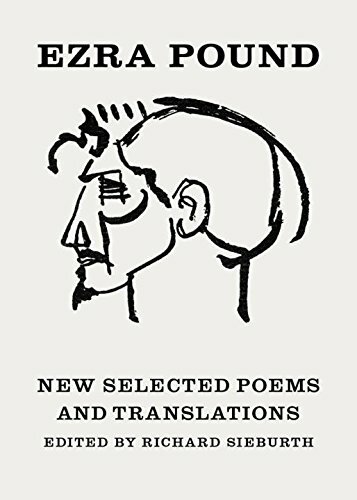 Reading Ezra Pound is not meant to be easy but this selection—which includes commentaries by John Berryman and T. S. Elliott as well as editor Richard Sieburth—helps make him just a little bit more accessible.